As I child, I remember sneaking downstairs at one of my parents holiday parties and grabbing handfuls of the closest food before retreating back upstairs. One of the items I took was smoked almonds which seemed very grown up at the time (I have no idea why). I don’t remember the other foods, but the taste and smell of those almonds have stayed with me over the years. There is not a holiday season that goes by without me purchasing at least a small container for old times sake. I started imagining what might be a liquid form of the characteristics of the smoked almonds I love so and the idea to infuse blended scotch with toasted, salted almonds was born. Once I had the infused scotch, my thought was to riff on the classic Blood and Sand (scotch, orange juice, and cherry liqueur), but after several attempts Katruska and I agreed that the toasted nut flavor was completely lost. It was then that Katruska remembered the ingredients of the “Pi” (walnut bourbon, mixed berries, and Stone’s Ginger Wine) at Top Flr. After a few attempts, the “Toasted Red Highlander” was created. Its flavor is light and refreshing with the flavors of thyme appearing first on the palate followed by cranberry and finishing with lovely toasted almond. The red color is also extremely festive with flecks of green. So, take a break from the holiday rush and relax with one of these by the fire. As they say in Scotland, “Slainte” (Too your health)! Muddle the cranberries, thyme leaves, and lemon juice together in a cocktail shaker. Add toasted almond scotch, Stone’s Ginger Wine, bitters, and ice and shake until well chilled. 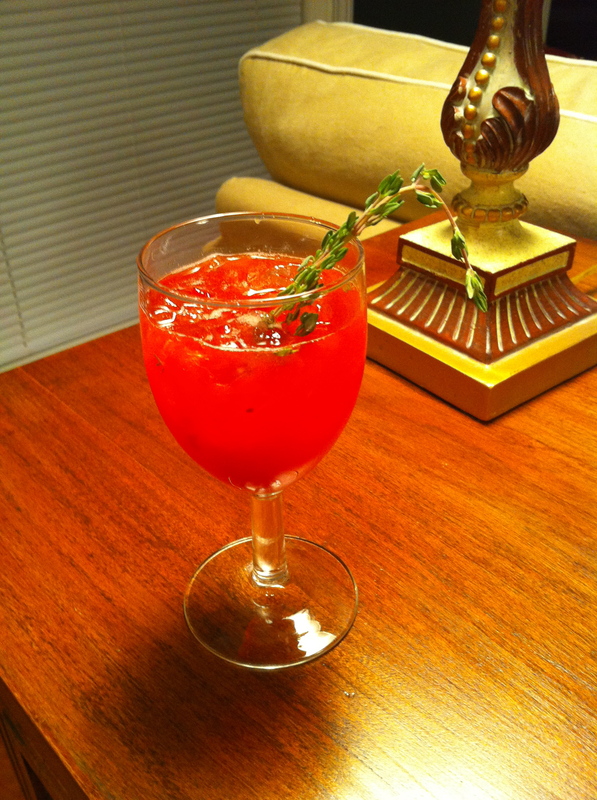 Pour all ingredients into a glass and garnish with thyme sprig if desired. Preheat oven to 400 degrees. Toss blanched almonds with sea salt and spread them in a single layer on a baking sheet. Toast almonds until golden brown (about 10 minutes). Put warm almonds in a heat resistant container (I use a glass bottle with a stopper) and pour in scotch to be infused. Let steep for 1-3 days or until desired strength of flavor is achieved. Now here’s a cocktail The Piper might recommend. It has a lovely name and it avoids ruining a single malt by using a blended scotch whisky, which IS a mixed drink as far as The Piper is concerned. Now for a real Highland drink, The Piper recommends the Islay single malt, Lagavulin. Actually, Islay is a region unto itself.